Discussion in 'The Chronicles' started by Klor Bishop, Apr 8, 2019. 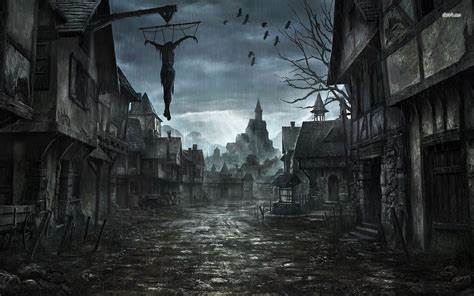 A light gloomy drizzle had darkened the sky for almost two days now in the sprawling town, a settlement within a league of the great city Vel Anir. The roads soft with mud and rutted with wagon tracks from the various comings and goings to the towns meager market place. In spite of the conditions people still went out about their business wearing heavy rain coats and hoods, plodding along spiritless and miserable. The noble of this village lived up in his stone keep surrounded by the houses and palisade wall, this is also where the garrison was housed. The noble used to be a powerful and kind man who ruled the village with wisdom and generosity, certainly the veteran of great battles in the past. But over the past few months a change seemed to have come over the noble and everyone inside the keep, ever since receiving a gift of a supposedly magical artifact that was rumored to warn people of dangers to come. Cruelty and tyranny replaced his kindness little by little till the people grumbled against him and conditions in the village became next to unbearable as taxes and labor was increased with little reward. A stranger in a muddy black robe, the person's face covered in the hood, stumbled through the palisade gates which stood open during the day, the guards in their little huts paid the figure no mind as he limped through the mud completely drenched from the rain. Others in the street avoided the figure as he stumbled and limped and weaved through the streets, splashing through the mud down the center of the town till he came to the town center where a stone well was erected and several shops and buildings were based, including a inn, a blacksmith, and a general supply shop. The figure stumbled into the town center and fell against the well, clinging to the side for a moment before falling on its face back in the mud. the rain and the mud soaked the cloak against the body of the figure and to some passing by the figure in the black robe seemed impossibly thin. but the figure now lay unmoving in the mud. People walked by or avoided the spot entirely, not wanting to get involved with some drunk or anyone who might be up to no good. Steve gave the butcher a small nod as they finished their trade, then with one last look back at the butcher who already was greedily looking in the sack he had been handed, Steve finally exited the butchers shop. Steve had been in town for two weeks or so at this point. He had heard of the villages plight and had arrived hoping to help ease it. Steve looked at the bones within his own sack the he'd received in the transaction. The whole town had been starving, the animals, and the people. The butcher had been ecstatic to trade the leftover bones for Steve's potatoes, with the potatoes the man's family would be able to eat for a little longer. Steve wondered if there were any animals left to butcher in the town, these likely would be the last animal bones he'd receive from the man. Looking around Steve wished he could save all of the people immediately, but he knew an exodus of that magnitude would not go unnoticed. Instead he set up as an apothecary in an abandoned shop, likely belonging to someone who got out before the situation drew to its current level. The shop acted as a soup kitchen as well, as the apothecary. Each evening Steve would serve a massive pot of potato stew to the people, while making some pun about how it is to die for. The shop also allowed Steve to look after the sick and dying, his true objective of being here. All the town folk really knew was that every now and again, someone would pass suddenly, but no body would end up being buried. Whenever that came to pass however the family of the deceased would personally receive a pot of Steve's stew as compensation. "If you want to set a record for not breathing I'm sad to say my grandfather has you beat by a few years." Underneath the hood was a white ceramic mask, even through the grime it looked inhuman, a faint hint of fogged breath escaped from the slit that was the mouth of the mask and the figure slowly turned the mask to look at Steve, no glint of eyes could be seen through the holes in the mask. A gloved hand came up and rested on the boys shoulder as he used him as a support to turn himself so he was leaning upright against the well, but the hand remained there. A voice finally echoed from inside the mask accompanied by weak but labored breathing, "What... town... have I... come to?" This place, it was perfect, hardships in every form seemed to surround such a village. Bad living conditions, illnesses, food shortages, crime and much more, it was the perfect picking ground for her cult. Just the mere mention of a clean place to stay and food would probably be more then enough to convert half the town to her side, how many more if she promised the gifts of her god? Just thinking about brought a sly smile to the heretical nun as she wandered through the muddy streets of this godforsaken place, still through it all a question remained, how had this happened? Despite is being useful for her own needs Vickorya was a little concern about the rumors going around, pertaining to the ruler and their sudden change in ways. Initial thoughts were on magic, but even then it seemed like the entire town... no region was under some sort of massive spell to make things miserable. In short she found it worth investigating, and if she managed to pick up some followers along the way all the better, she just needed to start off small, as to not seems conspicuous. Her chance came as some weak looking individual stumbled over at the town well, if it could still be called that. Such a person was clearly in need of help, no doubt it would make sense for a women of cloth like herself to offer aid. With her new target picked out Vickorya walked over to the man, coming closer just after some darked robbed man who was clearly not from around here posing a query to the fallen over individual. Getting closer she knelt down, getting a look of the person on the floor, certainly an odd outfit, quite interesting. As she examined him a voice came, asking about the town. "You wish to know your location? But a small village near Vel Anir, or what is left of one, you may as well have walked into a grave yard". Much was true, she doubted anyone in this place had the good will or supplies to help such a weak looking fellow. "But enough about location, art thou in good health? you seem fickle". TTamark and Klor Bishop like this. Steve pursed his lips, it would have been easier to have just brought the robed figure straight to his farm, as he didn't seem to be from the town to start from. First things first though, this man was not doing so hot. "Here," Steve reached inside his own cloak, and pulled out a wooden thermos, "It is some of my world famous potato stew... And if this town is a graveyard then that is a good thing because this stew is to die for, HAHAHA. Now I say this in jest, but though this is the best stew in the world, and fills those who eat it, be them living, undead, or automaton, with life, I have learned recently from some unfortunate cultists, that the continual consumption when you live off of deaths energy itself that the stew has a ninety eight percent fatality rate, and that two percent was probably just because I stopped him from having a third bowl of stew when his friends started bleeding from their eyes and ears. Now there is no guarantee that it was their living from death energy that killed them, these are cultists and it might have been some kind of mass suicide pact. I'm just saying that I have met some individuals of the living impaired, but none of them lived off of death itself, souls? Sure, but never death, so I am going off of a tiny sample size here. Anyways time moves on so let us get back to my medical shop, it is getting closer to the time I open up the shop for people to get a nice stew meal from me, and I need to get to it. You can finish recovering there," Steve turned to the new comer who looked like a nun of some sort. "And you ma'am are more than welcome to come and have some food as well, you did stop to help after all, UNLIKE SOME PEOPLE!" Kreyadis poked through the tree line which lined the village's perimeter, a staunch, seemingly careless gaze overlooking the homes squeezed together in close vicinity. The elf studied the battlements imposingly built above the respites of the common folk below, his ash colored ears twitching as a breeze drifted across the gloom-ridden scene. He had heard the rumors of the lord of the region finding some hidden, long lost treasure, a noticed shift in the lord's demeanor and public policy erring truth to some of the quieted tongues he'd eavesdropped upon while roaming the countryside. Kreyadis wondered of what nature this treasure hailed, whether powerful magicks were involved, something that may further his understanding of the Dark Arts, perhaps. He dared to enter the drab, muddied streets of the crammed village below his target, ready to find out more. Heavy, black plate mail clanged with each step upon the ground below, a slight mist emanating from the body, frost permeating the obsidian-like metals which made up the armor. A pale face calmly assessed each scene it came across with cool collection of information appropriate towards moving forward, whether it be finding the right questions to ask by listening to the random passerby's, or watching where the seedier folk steered clear of and gravitated towards to keep away from guardsmen. Kreyadis never had a real problem with the simpler folk, the less traveled, the less powerful. He wished to keep away as the city up in arms against him always proved to be a significant withdrawal of time. As a pair of them strode down the cramped alleyway just next to him, Kreyadis drew up a hood from under his long white hair to cloak his engraved face. From the current distance they thought nothing of him as he did so, unable to make out distinct details. While Kreyadis kept a generally low profile, his presence always drew attention from those who sought to keep peace. His presence held an air opposite of that effect. The tall creature continued down the main road of the village, watching its daily life unfold. The people here had shoulders that drooped or were hunched, hurried walking to and fro signifying the tension held within the atmosphere. Kreyadis' ears twitched again as he looked up to feel droplets beginning to fall once more, the rain on and off throughout the last few days upon arrival in these lands. He shrugged to himself, thinking of how he was going to need to replace some pieces in the joints of his extremities soon, rust beginning to pervade them over the last month. Kreyadis began to look around for momentary shelter as he came upon the scene by the well, looking upon the the strangers who inhabited the space before him. Picking up the sounds of their conversation, Kreyadis narrowed his eyes at the one who yelled. He found attention to be in bad taste, his want for obscurity debating with his need for information. The elf moved towards the opening of the inn to stand beneath a balcony overlooking the small center. He watched the group curiously in silence. Another crimson robed figure sat beneath the covered entrance of the inn, a small wooden cup held between the palms of cupped hands. Long strands of auburn fell in front of the face as it stared into the darkened water held within its fingers, pale white sprinkled with red around the knuckles. The man spoke quietly to himself in broken common, repeating basic phrases and experimenting with the grammatical rules in his mind. Thus far his teacher had helped him to learn that most necessary for common tasks, the basic questions and answers generally on repeat in his thoughts as he learned the foreign language. Nicopernicus had only known the orcish tongue and broken common phrases used throughout Molthal, purer tongue a more difficult concept to grasp than the gutteral language defined with much body language. The disciple whispered continuously to himself as his eyes darted up towards his teacher as she approached the two figures at the well, standing up and passing the daunting elf who took his place beneath the cover as he moved to help his master. The figure slumped when offered the food, the mask coming askew slightly but still nothing visible behind it in the shadows of the hood. It looked at the nun seeing her red robes, "A priestess... good... Someone who serves... Higher power..."
It reached out its other gloved hand to her, seeking either her hand or her shoulder for comfort. At the corner of its sight it saw the hooded giant standing in the shelter of the Inn watching them and another red robed priest approaching them. Powerful magic surrounded them all and the figure could see it through the askew mask. He spoke again, some strength seemed to return to his voice, "I... Can no longer... walk under my own... power... but what I can do... is give you... power..."
With his hand resting on the two of them in some way they both began to feel raw power flooding into them and their own magical capacities began to expand in every direction. Raw energy coursed through them and empowered them as if a powerful enchantment were placed on them. Finally the mask fell off of the figures face landing in the mud. underneath the mask and the hood was the grinning face of a skeleton, the skull gleaming white even stained with mud. After pouring its power into them, the skeleton slumped against the well and didn't move again. At the town gate a black robed figure limped through the palisade entrance, the guards looking confused as if struck by Deja Vu, but this time the figure didn't stumble aimlessly, it had a severe limp, but it walked with purpose to the town center and the well where the robed skeleton sat and the three people stood around it. The bone walker had served its purpose, he now knew he was in the right place. He watched as his skeleton poured its power into the Priestess and the dark magic user, when the skeleton slumped back into inanimacy Klor stepped into the town square a few yards behind them away from the group and opened his hand, the mask in the mud leaped into the air and shot like and arrow to his hand where he caught it and placed it over his face. That done he stepped forward approaching the group, the armored giant to the side not escaping his notice. His voice gave a disturbing echo behind the mask. "I am Klor. And I've an offer for you if we may speak." Kreyadis narrowed his eyes at the display brought forth by the necromancer, labeled as such in his head for manipulating the skeleton to draw forth those who amassed in the center. He watched with a curious gaze at the group before him, listening intently on the words spoken. When the name 'Klor' was brought forth a smirk adorned his blackened lips as the ashy faced elf studied them like specimen under a microscope, methodical and calculating with every detail which was brought forth by the others. He drew his cloak a little further over his face, so that the shadows from it may mask the most pertinent details, yet didn't move otherwise since he was properly intrigued by such a show. It seemed the rumors drew others into the area, something he hadn't anticipated, as Kreyadis thought most would rather avoid such calamities which befell the village. He was deeply intrigued by the fact that the skeleton had seemed to hold reserve mana from within, gifting it to those around it. Kreyadis thought this deeply interesting, something he had yet to come across. It was something which, if properly motivated, he could manipulate towards his advantage. His mind raced as his thoughts delved deep in the recesses to process the uses of such a power, something he had a desire to learn and experience for himself. His gaze wouldn't falter, even if anyone noticed the intense stare which held within it its own, sovereign energy. Klor Bishop and TTamark like this. Steve was pleasantly surprised to see that the individual happened to already be a skeleton, it meant he did not need to have the awkward "talk to your apothecary if undeath might be the right option for you" conversation. What Steve was less than thrilled about, was said skeleton trying to commit suicide right in front of him. "Noooooo! Suicide is never an option, unless you have made a deal with a necromancer beforehand, and as you are already undead that is no longer an excuse!" As soon as the skeleton slumped Steve knew that negotiations were no longer possible. With that Steve did a dramatic flip of his cloak exposing rows of potatoes strapped to him, as well as four small sacks with red cross' on them that hoped out and begun pulling out potato after potato, and handed them to Steve who was shoving them into the skeleton. "Oh, no you don't! I don't know why you are trying to die, but every life is valuable... Wait a second..."
Steve began to realize something wasn't right here, and when the mask went shooting off, and he turned to follow it he knew why. Steve gave a small nod towards the skeleton before responding, and the four sacks split up grabbing its arms, head, and back. "Oh, alright, fine, but I am taking this skeleton so it can become more than just a tool. Besides as I said before I stuff I have to do, so if you want to talk: grab a leg, and follow me, my shop is just around the corner a bit. Oh, and I'm Steve, The Spudmancer Supreme." Klor nodded to the spudmancer, he had seen stranger applications of magic than this; "Seems fitting that the remains of a potato farmer be carried by animated potatoes." He turned his masked face to look at the priestess and her acolyte for a moment, then he turned again to look at the armored giant in the shadows and gave him a slight nod. Once he acknowledged everybody he motioned for Steve to lead the way and followed him. He still walked with a sever limp, all but dragging his right foot behind him, but he managed a good speed and didn't seem to be in pain, his leg was simply useless under him. He came to the village fully knowing the rumors about the noble and the artifact, that artifact never should have landed in the hands of someone unversed in magic or artifacts, there was much he discerned about the item just from the rumors alone and from that he wanted to attempt to free the noble from the item and return peace to the village. But first he wanted to see if the rumors had brought others here, this test with the skeleton did not prove anything but it did tell him of others of ability and at least some form of goodness within them that had been brought to this town for one reason or another. A nice warm meal did sound kind of nice, herself giving a nod towards the merchant looking man when the offer came, but her focus was still on the strange being laying on the ground in front of them. Though not really knowing what 'it' was Vyrokia felt a lack of life from the being down on the floor, the mystery of the strange being only coming to a close once it's mouth opened again. apparent 'power' became transferred to herself and Nicopernicus. Such a feeling was new, strange, but certainly not unwelcoming, a broad smile coming over her as she once again stood up, flexing her fingers which now bore such magic. At least that is what it seemed, the nun's eye falling back to the man on the ground, just in time to see his face in the light.. a skeleton. Instantly the thought of necromancy came up to mind, but still many questioned remained, who was this 'man' why were they here? what had happened to them? Such question would have to wait as two figures approached, well one, a strange dark armored being had been off to the side for a bit, though not having done anything as of yet to warrant attention. The other individual that had arrived only seemed to reinforce her wonder about the recent events, it being obviuse that he was connected to the now, dead dead skeleton on the ground. The compatriot which had offered help kept ranting and raving to her displeasure, so nosy, but nothing that couldn't be zoned out, Vicktorya looking to the person named Klor. "An offer you say? very well, but my disciple follows me where ever we go, okay". What even 'offer' the strange being had in mind she was more then ready to accept if it increased her already boosted power, and unlike some other holy women dark arts were not something she shed away from. Nicopernicus watched inquisitively from beneath the hooded robes he adorned, never before seeing a display such as this. Even while he felt his own magical prowess growing, this was to him an exemplary example of the raw scale and magnitude one could reach. It made him anxious, however as the disciple heard his master speak his name, his nerves calmed. He couldn't understand the entire conversation held before him, however based off body language and the notice of the party starting forward, helped the Spudmancer with the skeleton. Hoisting one side up, he followed his liege wherever she went. Kreyadis thought such a particular endeavor towards manipulation of such a breed of plants useless, pointless, incomprehensible towards the grand scheme of things, with what you could acquire if the same amount of time and study were involved towards other notions, one could be of a prime cut in regards to sating desires. Still, another half of him deemed it a bit of respect. 'Everyone must learn to know their place.' he thought as well. Kreyadis would wait until he was certain no one noticed his presence lingering behind the main group, before following along to see what more information he could gleam of the situation he presently found himself in. He moved deliberately slower than his normal walk, faster even when fully armored. The large elf kept his gaze low to the ground so that no guards would see his face, this was not the time for him to draw unwanted attention. "Animated potatoes?... Animated potatoes! ANIMATED POTATO GOLEM!!! Wow, all this time I was focused on preserving life, I never bothered to try and play a god by creating some life. Ah, here we are. follow me and I'll show you the truth behind these anonymous helpers." As the group drew closer to his shop the smell of potato stew continued to grow stronger, it had not taken long for the line to enter the shop to come into sight. Steve motioned for the group to follow him as he, instead of going through the front entrance of his apothecary shop, went down an ally beside the shop to enter through a back entrance. The door looked ordinary enough, but those with the talent to see enchantments could see that the door had two enchantments: one to reinforce, another to discourage forced entry. Steve pushed a potato into the door and entered. To the right of the entrance the yellowed skeleton of a rooster crowed, alerting all in the back room to Steves arrival. The backroom was a small room with the walls lined with coffins, the floor was covered with the dead or those upon death's door, all tucked tidily into makeshift beds. In the corner a massive pot sat over a large bed of coals, and under a chimney. A large stack of potatoes lay in the opposite corner. Within the room all sort of critter: rats, rabbits, chicken, pigs, and a number of others, though lacking skin, and muscle moved around the room, some lazily rested upon bundles of cloth, some looked after those upon the floor, while some other sat upon the edge of the stew while stirring it. Upon the realization that Steve had returned, many of the animals(particularly the chickens) rushed over to him. Steve bend down, and affectionately greeted each, while also pulling the sacks off of the four chickens who had brought the skeleton back. "See they were chickens the whole time!" He turned to the undead once more, "Alright so I need to talk with these folk for a touch, so I will have some of you dress up, and serve the stew for today, alright?" While a new group of chickens wiggled into the costumes, Steve went to one of the dying, and held out his hand, in which a potato was soon placed. Steve put the potato into the man's mouth where the man then breathed his last. Steve then carried said potato to the "potato farmers" corpse, where he then shoved the potato in. The skeleton stood, looked at its hands, and let out a soft whine. Steve immediately pulled it close in a hug. "Hey, it is going to be ok. You are reborn, and you are free. I would recommend for you to come to my farm while you learn to speak, as well as who you are now. Please step into one of these coffins, and I will properly look after you." Steve then turned to the group to explain, "The man who died requested that I not turn his body into one of my "abomination", and I respect a patients right to consent, but he never said anything about not using his soul to revive him, and he passed out before I could ask. If he decides he wishes to die when he learns to speak again, he still holds his right to. Now, Klor was it? What did you want to talk to us about? After seeing the menagerie he began to question his decision, but there was no doubt this person was skilled in necromancy and could be a big help. "Very well, my offer is this; I am sure some of you are at least aware of the state of this village, the noble has become cruel and corrupt and I believe that it is caused by a powerful magical artifact rumored to be in his possession. I intend to remove the artifact from his grasp and in doing so restore his sanity and fate willing conditions will improve for the people here." He looked at those who listened, "I cannot do this feat myself, unfortunately. I believe the ruse earlier was necessary to bring out those with the best of intentions that would be willing to stand up to the powers that be to help restore this village to prosperity. What I can offer is your own true potential until the completion of this task." The merchant man was certainly into potatos, maybe a little more then one should realistically be, was it some sort of fetish? She didn't really want to know, just focusing her attention on Klor, while having a small bit keep and eye on the strange dark skinned man trailing behind. As they finally came to a rest she was certainly intrigued by Klor's offer and mission, though quite interested in the strange artifact that was responsible for the current state of the village. Ideals and plans on how to use such and item rolled around in her head as more information was divulged to the group. "Well, you goal certainly seems noble I must say, as a women of the gods it is required of me to join you in such a task and lift the curse off that's befallen such a village". Even if her motivations were a little less then noble herself, but for the moment playing along with the 'holy' nun routine would have to do. "You can count on my aid and divine magic for the upcoming task Klor, and my disciple Nicopernicus will be lending a hand as well". Kreyadis followed the party through the gloomy streets and perched himself near a doorway a bit further down from the side entrance of the shop. He whispered quietly to himself incantations, forefingers and thumbs shaped in a triangle, the rest folded behind, lips nearly pressed to the nails of his digits. A misty haze billowed slightly before him, two oval slits outlined in the shadow. Kreyadis jerked a thumb towards the doorway of the shop, the shade walking through him towards the location, his ears suddenly picking up the conversation. 'It may be that knowledge might be obtained from the object, an idea best to be entertained,' he thought to himself. The rain dripped from a gutter above onto his shoulder, Kreyadis turning his body to press against the wall, staring up at the cloudy sky. He wondered if the weather would hold the way it was, preferring the sun's rays blocked this time of day. The muffled steps of boots in mud could be heard coming from the main road, and a pair of guards turned down the corner into the alley way. Kreyadis slowly looked towards the ground, silently cursing himself for the bad luck. Chain mail rang in the distance, leather slopping through muck meandering near. He couldn't release the shade without drawing attention, and he knew one pair of eyes were on him already. As the pair moved closer, the daydreamer of the two suddenly stopped in front of the side entrance as he noticed the slight decrease in light in the immediate area, and his partner's eyes met his in confusion. His partner, already skeptical of the skulking elf armored in black, hailed for him in a gruff, raspy bark as the spectre was noticed. "Oi! Dropping the eaves are we? Using black magicks by the looks too, that ain't taken kindly in these parts!" The pair drew swords from their sheaths, Kreyadis stretching his arms back to loosen his extremities. The speaker stepped in front of him and placed a hand on his shoulder, the elf preemptively elbowing him in the mouth to muffle any extraneous noise, rusted hinges groaning above his victim's soft moans. The speaker fell back into the slosh, Kreyadis stomping on his throat. The speaker only spoke garbled syllables after that, twitching eyes pressed to the sky as his soul careened into the air. The remaining daydreamer suddenly grabbed at his own windpipe, the smoke coalescing around him from inside the shade as it seeped into his cavities, snuffing the life out of him. Kreyadis took a large dagger from a hilt on his hip and stuck it through the fingers gripping the esophagus, blood gurgling forward, dripping from the lips of the guard, another confused look mirrored by snarling wrath as the ashy skinned elf whipped him to stand in front of the building before he headbutted the hilt, tacking the guard up on the wall outside the door of the side entrance. Anger seeped through the elf for the intrusion and lost all track of his modus operandi a moment in the face of things gone wrong. He came to again moments later in the midst of his struggle, shrugging to himself as he picked up the body strewn in the street, handling it like a sack of potatoes as he then knocked on the door. 'So much for stealth,' he thought. The hooded individual suddenly donned his own dirk from amidst the flowing crimson robes, moving to cover the door from the side immediately after the sound of the blade jabbing into the wood alerted him of the presence outside. His free hand held a spark of fire in the palm, motioning to the rest of the group that someone was outside. He peered through the window and saw nothing but a shadow, confused at what had made the noise. "That is quite a large leap in logic from a ruse to see who would help a man in need. I would even argue that there might be some less than noble individuals who would be interested in a dying man. You are far too naive Klor, but so far that is the part I like most about you. Also, offering people straight up power... Do you want villains? Because that is how you get villains. Speaking of which, you are lucky emperor penguitine didn't hear you. It seems all he does is yell, "Unlimited Power!" and shoot lightning. Poor guy, knocks himself out each time. I would hate to see what he'd do with real power before he had learned to behave. Anyways, so you want to deal with the problem at the roots? That is a good enough reason for me to help you out. I have to ask though: What is it that this artifact does? I have learned that it tends to be a good idea to know what you are walking into. Do you have a plan?" Steve served every animal, and person in the room a bowl of his magic potato stew. At the knock he turned to the door, and yelled over in a singsong voice, "Who is it?" before flinging his arms in a shooing motion towards his animals. Some animals jumped into some of the coffins, the chickens climbed into two stacks of five and covered themselves with cloaks, some hid in the bone pile, and the the last few hid within the stew pot itself. Satisfied that the animals were somewhat hidden Steve rushed over, and opened the door with a great big smile. Kreyadis flung the body of the guard he carried over his shoulders into the arms of the dark robed man before him. He moved back outside a moment to take down the decorations from beside the entrance and then piled it on top of the first as he shoved his way inside, shutting the door behind him so that no one else would see. The dimness of the room cast shadows about his face, the obsidian armor glinting in the candlelight. When his eyes trailed over to Nicopernicus and his stance, he shook his head. "That would be most unwise, child," he said before casting a glance about the rest of the room. "I too am curious to hear of these ventures, masked one. Allow me to bear witness to this conversation, I am most intrigued by the subject of which you speak." Kreyadis emanated a cool chill in the air surrounding himself, anyone close to him may taste the feint hint of iron in their mouths, as if their blood were trying to find its way to him. The towering knight had an aura of deep unknowing, as if a certain sense of dread crept into the shadowy corners of the shop, whispers garnered from their depths. His ears flickered with the cracking sounds of the fire, which he did his best to avoid the light of, incessantly aware of it as he spoke. "My ears have picked up little traces and wisps of meandering conversations regarding this matter, however to my dismay have been unable to unearth more. What qualities of concern have you been able to attain, and where has such information been given, I might add?" he asked in delicate fashion, however his eyes filled with a certain annoyance at what he saw as wasting time, the creature eye level with the one he posed the question to. Did this man ever shut up? The dribble of words coming from the 'patato wizard' was starting to become annoying. Still her smiling expression did not change, her act unwavering through the entire conversation. All in all a small price to pay in order to get a chance at this strange artifact apparently being kept by the lord. While awaiting word from Klor it seemed they had a visitor, Vickortya placing her own palm against her disciple, slightly shaking her head. "We do not resort to violence straight away, talk first", even if she was certain the strange dark armored man was quite sketchy. but she did not fear him. If anything the overall appearance of what she assumed to be an elf made her seem them as a potential rival, what ever their business was here the person certainly had an interest in this suffering town. "If you wish to help I have no objections, unless otherwise spoken by others around here", he was one that did not attain the strange power from the skeleton at the well, but even so there was always the potential for the man to be a strong warrior. In the end Klor decided who came with him on the mission. Nicopernicus snuffed the tiny flicker of flame and sheathed the blade, standing up straight and narrow as the palm reached him. He slowly nodded at the woman's words, muttering "talk first" as though he never heard it before, playing with the syllables in the roof of his mouth, drawing them in with every breath, stretching them out as if it were his first comprehension of the phrase. He understood what she meant by it, as the aura she gave off gave him the feeling of peace, yet he didn't know whether or not she were going to be completely trusting of the overbearing figure in view, one who brought in bodies with him. Nicopernicus didn't trust the elf who suddenly stormed into the back of the shop, the taste of blood rising within his own mouth. He heard faint whispers at the end of every wisp of wind, unease as the shadows seemingly grew. The essence of darkness seemed to thicken with the man's presence, and uneasiness pervaded his demeanor. The crimson robes shook slightly as he did, taking a step back to stay in line with the woman he accompanied.